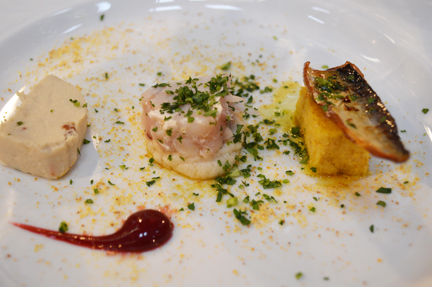 Above: Tench pâté, pike crudo, and marinated sardines by my current favorite chef in Italy, Vittorio Fusari of Dispensa Pani e Vini (located in the heart of Franciacorta). Let’s face it: Vinitaly — Italy’s annual wine trade fair in Verona — isn’t exactly known for the seamlessness with which it executes. Last year, the cellphone and wireless network were offline the entire duration of the fair (leading to utter chaos among fairgoers attempting to confirm appointments via text and email). 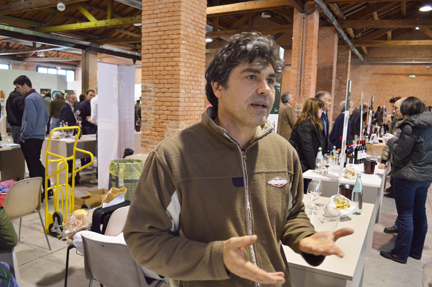 This year, a two-hour lunch event for Italian wine bloggers was delayed for an hour and fifteen minutes (supposedly because Daniele Cernili went overtime for his event in the same space). I was invited to the event and spent an hour chatting with my Italian blogger colleagues outside before I had to move on to my next appointment. 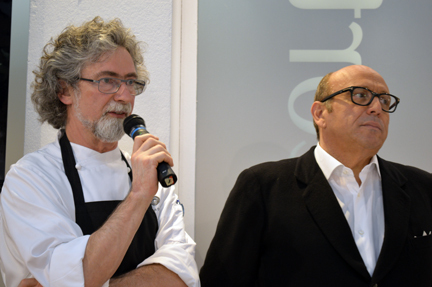 Above: Chef Fusari and Franciacorta consortium president and legendary bon vivant Maurizio Zanella. But, man, when it comes to putting on a Vinitaly event, the folks from the Franciacorta Consortium sure know how to get it right. Not only did the event “Franciacorta in Cucina: l’arte dell’abbinamento” (Franciacorta in the Kitchen: the art of pairing [food and Franciacorta]) start right on time, its entire execution was flawless, with superb food (by Vittorio Fusari), world-class waitstaff (from his restaurant), and an excellent speaker, Nicola Bonera, the consortium’s in-house sommelier (winner of Best Sommelier in Italy 2010). 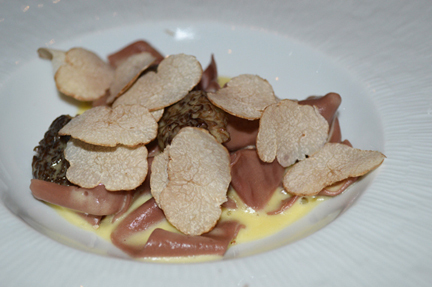 Above: The menu included five courses and five wines. My stand out was the Arici rosé, made by my good friend Giovanni Arcari who had invited me to the event. I get invited to SO many events like this and I reluctantly accept, knowing that they’ll probably start late, go over time, and bore the guests with a speaker who talks down to the crowd like preschoolers. The event was nearly seamless… except for the fact that I had to request a dump bucket, which appeared a few minutes after my petition. 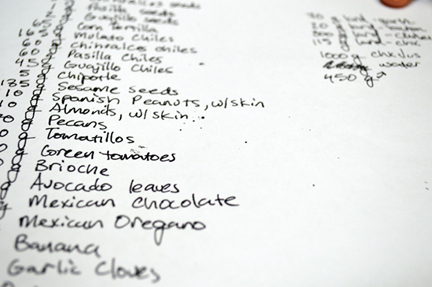 I still haven’t posted my photos and notes from the two visits that Tracie P and I made to Fusari’s AMAZING restaurant in Erbusco (and I will soon). In the meantime, the moral of the story: when invited to a Franciacorta Consortium event, ACCEPT the invitation! 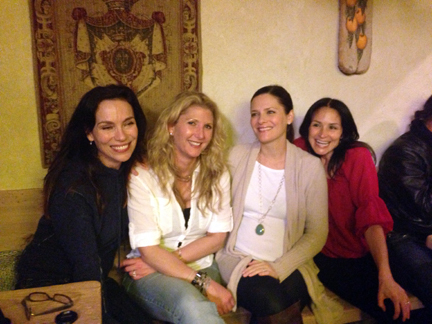 Just had to share this photo, sent by one of my best friends, of the “band wives” on the night of the first of two shows that my band “the Americani” played earlier this month in the village of Cison di Valmarino in the province of Treviso (Veneto). That’s Tracie P, second from right. Above: Hamilton 90, the Boccaccio “autograph” manuscript, from the Staatsbibliothek in Berlin. Image via Quirinale.it. In the world of rare books (a world I used to inhabit in my academic days, when I studied and wrote about Italian incunabula and humanist amanuenses), most “special collection” libraries observe the same protocol when two scholars request the same manuscript or codex on the same day: the librarians give the manuscript to neither. 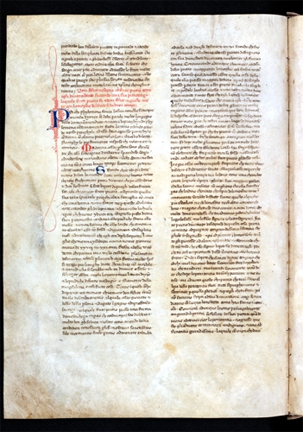 One of the most notorious anecdotes from my days as a student of scribes was that of two illustrious Italian professors — one Italian, one American — who competed to discover the earliest autographed redaction of Boccaccio’s Decameron, in other words, his first “authorized” version of the work, transcribed in his own hand (a holy grail among philologists and paleographers like myself). When the one professor discovered that the other was headed to the library in Berlin to request a viewing of the vellum, he raced to arrive before his colleague and he swiftly put in a request to view it as well. As a result, the librarians gave it to neither that day. Ultimately, the one professor stole the manuscript, took it to Rome, had it x-rayed, and became the first to prove its connection to the fourteenth-century author. He replaced the manuscript before anyone noticed. Not long after, the other professor killed himself. There’s a saying in academics, the competition is so fierce and the enmity so ferocious because the stakes are so low. And the same can be said about wine writing. Above: Codex Hamilton 90 is currently on display in Rome, in a show organized by the Italian government. 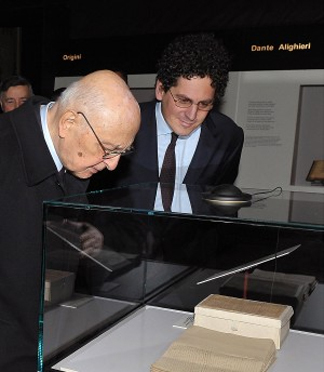 That’s Italy’s first two-term president, recently re-elected Giorgio Napolitano (left), viewing the show. An article devoted to the show appeared in today’s edition of Repubblica. One of the ugliest episodes in the history of oenography has been playing out over recent months, with Montalcino as its backdrop. If you haven’t been following along, the Brunello consortium announced last week that it was expelling and suing one of its members for defamation. (Here’s a link to my post on the legal action; it includes links to my reporting of events that led up to the consortium’s move). December 2012: Soldera’s winery is vandalized; six vintages purportedly destroyed. December 2012: Consortium offers to donate wine to Soldera winery out of solidarity. March 2013: Soldera accuses consortium of encouraging him to commit fraud when offering to donate wine; announces he’s leaving consortium; announces that he’s recovered a good quantity of wine and that he plans to sell it. If Gramsci Pasolini Marx were alive today, he surely see the situation in Montalcino as a text-book example of his theories. In the 1950s and 60s, Montalcino was still an agrarian economy, with a few patrician families — like Biondi Santi — who served as stewards of its production of fine wine. In the late 1960s, “big wine” arrived: American-based Banfi set up shop, not to produce Brunello but rather to produce sweet sparkling wine (Moscadello di Montalcino). In the 1970s, Soldera, a rich Milanese insurance broker, who was unable to acquire property in Piedmont, bought land in Montalcino and started to produce fine wine. By the 1980s, Banfi had shifted to the production of Brunello and helped to make Montalcino as a brand in the U.S. through high volume and aggressive marketing. There were many other players in this equation but these two more than any other reshaped the way Brunello was perceived beyond Montalcino’s borders. And in doing so, they changed the way that the Montalcinesi viewed themselves. On the one hand, Banfi opened up the world’s largest markets to Brunello. 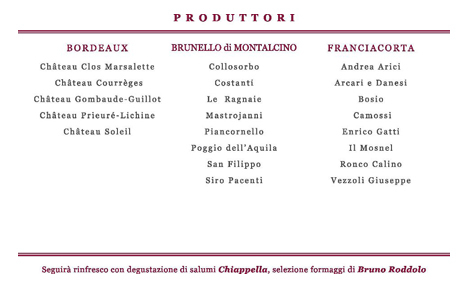 In the 1960s, there were only a handful of Brunello bottlers. Today, there are more than 250. On the other hand, Soldera transformed Brunello into an extreme luxury product, delivering bottles that fetched astronomical sums. Along the way of this dichotomy, Montalcino passed from de facto feudalism to full-throttle capitalism. And the tension that has come to a head here is, in many ways, a dialectic held taut by a battle between agrarian and capitalist values, with indigenous growers on the one side and outsider financial interests on the other. Add to this mix that Soldera is generally considered a carpet-bagger (he is) and that his cantankerous personality and his unbridled egotism have won him few friends there. After years and years of acerbic commentary (public and private) from Soldera, it was only natural that a situation like this would arise (many in Montalcino predicted something like this in 2008, when it was rumored that Soldera had sent a letter to authorities igniting the Brunello adulteration scandal). Let’s face it (and it’s high time that someone wrote this): when news broke that Soldera’s winery had been vandalized, many observers of the Italian wine world (myself included) couldn’t help but think, to borrow a phrase from Lennon, instant karma’s gonna get you. Was the consortium right to sue him? It’s not for me to say or pass judgment. Most on the ground in Montalcino believe that his “resignation” stunt in March was a means to let the world know that he had miraculously recovered wine to sell. No one can know for certain. But the consortium and its members had to do something. If they didn’t, they’d be allowing the “broker from Treviso,” as the consortium’s lawyer has called him, to exploit their brand in the service of his own personal agenda (this is how many in Montalcino view the situation). Does any of this matter? Maybe to Marxists like me. The bottom line is that the renewed controversy has only helped to keep Montalcino in the news. 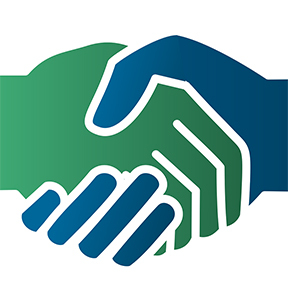 And as any public relations veteran will tell you, all news — even bad news — is good news when it comes to raising awareness of your brand. In other news, over the weekend, newly elected president Giorgio Napolitano, after a nearly three-month stalemate, ushered in a new government to be headed by political scientist and statistician Enrico Letta. These political acrobatics (as the New York Times has called recent developments) are remarkable: Letta, center left, has emerged as “bridge builder” from a seemingly intractable deadlock, with the support of the most vitriolic opponents on either side of the aisle. Only in Italy, some have said, shaking their heads (myself included). But it’s all part of our my fascination with Italy and the enigmas of its greatness. If you get the reference in the title, you’re as sad as we are. 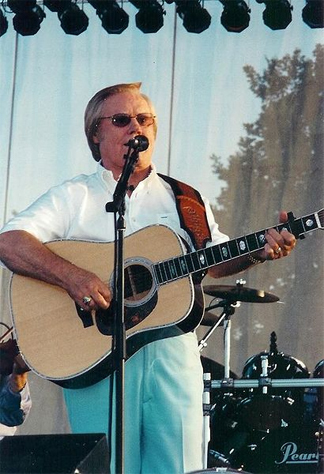 Rest in peace, George Jones. BTW, Beaumont, Texas, where he lived (and not far from where he was born), is just a few towns west of Orange, Texas, where Tracie P grew up. Above: While in Italy in early April, I tasted with my favorite producer of Gaglioppo, Francesco de Franco of ‘A Vita, at the Vini Veri gathering in Cerea. Next week I’ll post my notes from the fair. 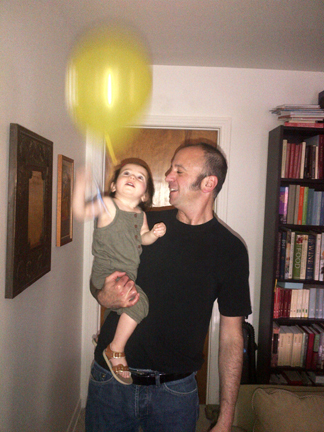 I was thrilled to see Evan Dawnson’s superb post earlier this week for Palate Press on Gaglioppo. After all, our friendship took shape over a glass of Garganega followed by a glass of Gaglioppo a few years ago in Brescia, Italy at the European Wine Blogger conference. Since we launched our all-southern Italian wine list at Sotto in Los Angeles more than two years ago, my cohort Captain Wine and I have been preaching the virtues of Gaglioppo to our guests. 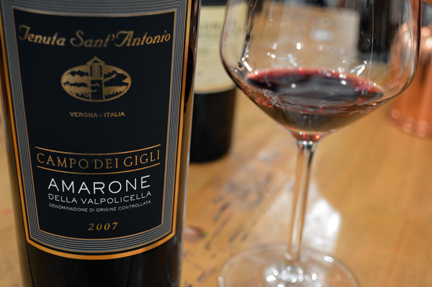 We weren’t surprised that the 1997 Gaglioppo by Ippolito quickly became one of our top sellers. 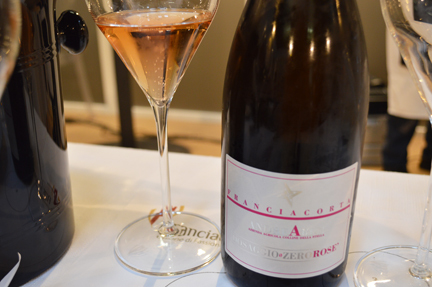 One of the most thrilling wines I tasted this year at Vinitaly wasn’t a thirty-year-old Sangiovese or a gorgeous Franciacorta rosé. 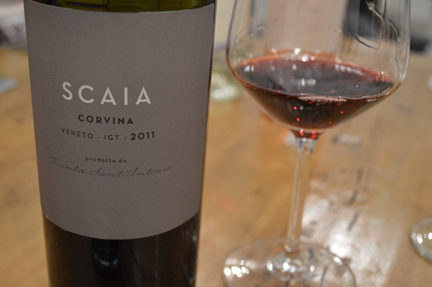 No, it was a wine that should retail for under $15 in the U.S.: a humble, fresh, bright and brilliant expression of Corvina by Tenuta Sant’Antonio (above, one of my favorite Valpolicella producers), vinified in a light, food-friendly quaffable style — the kind of wine you just can’t stop drinking. Scaia is a dialectal term that appears in the western Veneto and in Lombardy. It denotes gravelly or pebbly, a reference to the diluvial subsoils commonly found in the ancient river valleys of the Valpolicella where this wine is grown and raised. I’ve been a fan of Tenuta Sant’Antonio since I first tasted the wines in New York back in the late 1990s. The brothers who make the wines are farmers, children of farmers, and the wines they make stay true to the Valpolicella that I know and love. So much of the Valpolicella and Amarone that floods the American market these days is over-extracted and over-laden with alcohol. I’m so glad to see (and taste) that the Castagnedi brothers have stayed true to their roots and the great wines they’ve historically produced. Thanks, again, to Master Sommelier Craig Collins for setting up our appointment at the winery’s Vinitaly stand. 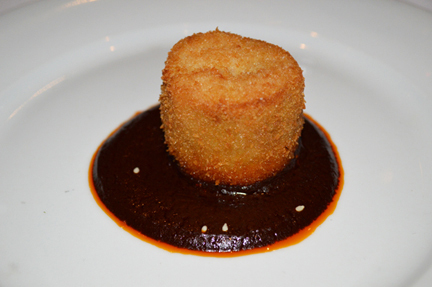 The standout dish of Tony’s California Cult Wine dinner in Houston where I spoke on Tuesday night (yes, about California cult wines) was the above: poached sweetbreads that had been layered into a cylinder, breaded and fried, and then served atop a dollop of Oaxacan black mole. 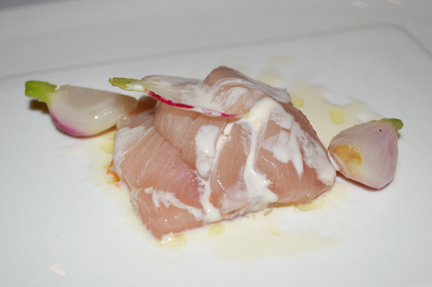 Chef Grant Gordon obsessively sourced all the ingredients for the dish, which took him more than a week to prepare. He said the chiles chihualces were nearly impossible to find but was able to obtain after calling three stores in Mexico (two were sold out, he said). At 13.4% alcohol, I thought this Greg Linn Pinot Noir showed beautifully. 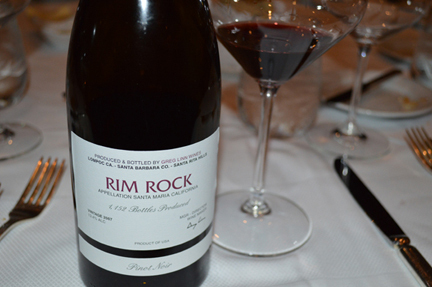 Maybe not the earthiness I look for in old world Pinot Noir, but great acidity and wonderful balance. I liked it a lot. 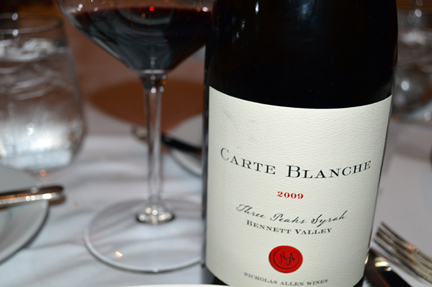 I was also really impressed by Carte Blanche Syrah by Nicholas Allen. It showed a lot of depth for California and I liked how it had been vinified in a lighter style, retaining all the hallmarks of Syrah but also delivering lovely foodfriendliness. It paired brilliantly with the roast lamb. There’s a new wave of young Langarolo producers who have returned to the old “traditional” style of Nebbiolo (that I prefer): wholesome farming practices, minimal-intervention vinification, and large-cask aging. 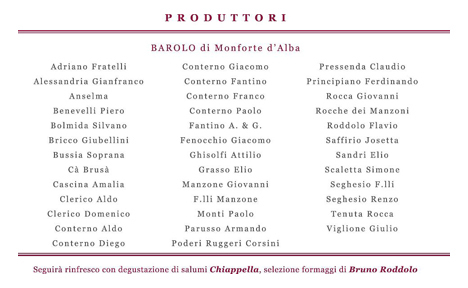 Many of them are the children of Barolo’s marquee names. And many of them have diverted their families’ wineries from the path of modernism. 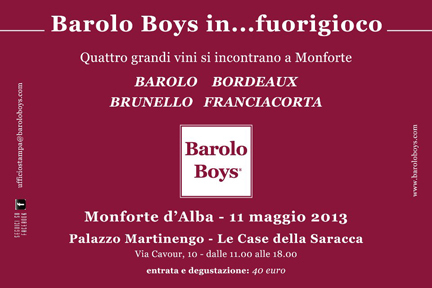 My close friend and Franciacorta winemaker Giovanni Arcari has curated a portfolio of some of his favorite producers in Franciacorta to be presented May 11 together with the Nebbiolo at a mother of all tastings in Monforte d’Alba.